Analyzing and assessing the quality and output of American foreign policy is a daunting task for central planners and policymakers. Where to begin prioritizing such an undertaking is only the beginning of the challenges officials face. By following recent reporting of major newspapers and television news programs, one would assume that the current state of international affairs reflects the failed policies of the current White House administration. Unfortunately, assessing United States international efforts in this manner is both a dangerous and short-sided method, for a highly cultivated and mature democratic society to employ in evaluating the policies of its leadership. Though the domestic and external politics surrounding states such as Syria, Iraq and Ukraine, are all highly important to the U.S., it is foolhardy to suggest that these situations represent the extensive number of programs, initiatives and other different projects around the world that the United States is involved in. But if observing the news is not the answer, then by what measure can one begin to analyze the efficacy of American foreign affairs? 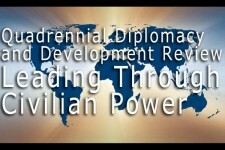 Enter the Quadrennial Diplomacy and Development Review (QDDR). Originally launched in 2009 at the behest of then Secretary of State, Hilary Clinton, the QDDR was instituted to seek ways in which the U.S. State Department could better advance the variegated interests of the American people. The QDDR builds off of previous federal organizational reform efforts such as former Secretary of State, Condoleezza Rice’s, Transformational Diplomacy initiative, as well as quadrennial reviews by the Departments of Defense and Homeland Security. The invigorating changes included within the QDDR are distinct from these previous initiatives because it collectively includes important elements from each of these past reports and comprehensively evaluates the State Department’s entire civilian component and how it correlates to the president’s political, military, socioeconomic and diplomatic segments of his broader foreign policy strategies. Creating a position of Senior Advisor to the Secretary for Civil Society and Emerging Democracies. Launching at USAID – which is the world’s first development agency to establish democracy, human rights and governance as a core development objective – a Center of Excellence on Democracy, Human Rights and Governance. There is much anticipation surrounding this report. From it, we hope to evaluate whether the current administration has overcome any of the challenges or implemented any of the recommendations set forth in the first QDDR report. Information from this study will give policymakers the knowledge necessary to make more informed decisions towards regions around the world that are becoming increasingly difficult to manage and hostile to American commitments. This initiative will also provide better insights on how the current administration has redeemed itself from past policy missteps, as well as how it has capitalized upon areas considered advantageous. Throughout the State Department tenures of both Hilary Clinton and Condoleezza Rice, it was widely known that the nation’s diplomatic corps was largely understaffed, leaving vacant several important posts within highly strategic geographical areas around the world. Clinton also highlighted different compartments within the State Department’s bureaucracy, as well as several sites around the world, that were seriously underfunded and placed several aspects of the president’s objectives at serious disadvantage. It is also important to mention here, a significant difference between the QDDR report initiated under Clinton,and the report recently launched by Kerry. Whereas Clinton was highly ambitious regarding the scope of her evaluations, Kerry has chosen to cast a more narrow net. In his remarks at the official second launching of the QDDR in Washington, D.C., Kerry invoked the advice of a foreign service officer who told him shortly upon assuming his post, that, “if everything’s important, nothing is important.”With this second report, we should expect Secretary Kerry to focus his energies not on a large-scale and systematic examination of the agency’s entire civilian force, but on a select few significant challenges which he believes will enhance the nation’s strategic direction as well on the ground operations. The QDDR has its shortcomings, such as its limitations in its ability to address an organizational culture cemented to outdated traditions. The 2010 report has also been criticized for not outlining enough steps to create the necessary conditions for real change. Despite these limitations however, it isserious and deliberate examinations of this quality that the American people will find most useful when it comes to measuring the state of theirnation’s foreign policies. Commercial and for-profit journalism plays an important role in informing the public and in keeping the government honest, but only if such reporting stems from an objective and zealous pursuit of the truth.Analytical studies utilizing different quantitative and qualitative research methods also play a meaningful role in maintaining an informed population,alongside a responsible government.Thesecond QDDR report is still underway and its results are forthcoming, the 2010 report however,can be read here. Author: Antwain T. Leach, MPA, is president of the Center for Strategic Affairs and Public Diplomacy, a think tank that provides management consulting services to political organizations, social campaigns, as well as to community & faith-based organizations. He was previously employed as a congressional aide in the office of former Congressman Bart Gordon, where he worked on public administration issues. You can reach Mr. Leach at [email protected].